The instructions below only list data-lake specific steps. 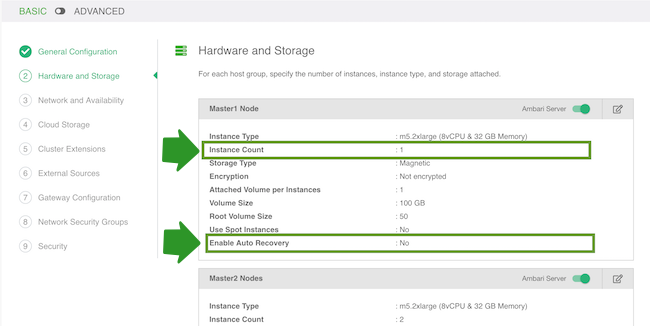 For information on other cluster options refer to the documentation for creating clusters on your cloud platform. In Cloudbreak web UI, navigate to Clusters, click on Create Cluster. For example, if using “mydatalake.local” as a custom domain and “prod” as a host name, the actual host names will be prod0.<cluster-name>.mydatalake.local, prod1.<cluster-name>.mydatalake.local, and so on. 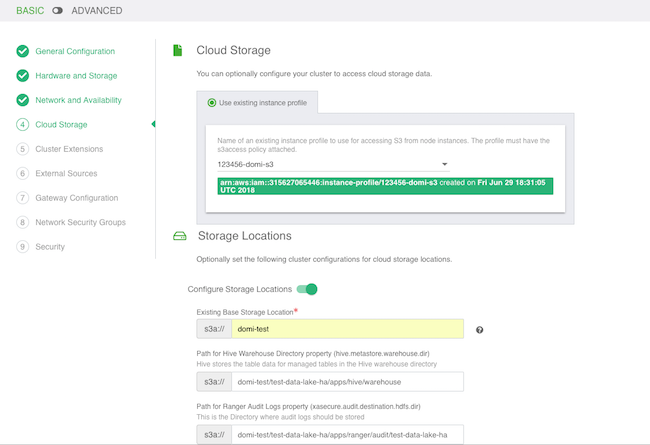 Under Storage Locations, provide an existing location within your cloud storage account that can be used for Ranger audit log. if using HDP 2.6, this will also be used for Hive metastore directory and Hive warehouse directory. If using the HA blueprint, this location will also be used for HBase Root Directory. The storage location must exist prior to data lake provisioning. If the storage location does not exist then Ranger is installed properly, but it may not work. On the External Sources page, select the previously registered Ranger database, Hive database and LDAP. On the Gateway Configuration page, the gateway is enabled by default with Ambari exposed through the gateway. You should also enable Ranger by selecting the Ranger service and clicking Expose. On the Network Security Groups page, you do not need to change anything. If you would like to restrict the open ports, refer to Default cluster security groups. Click Create Cluster to initiate data lake creation.